Discover the charm of an old traditional house built of local stone, tastefully restored with a warm and friendly welcome to all of our guests. We are located 2 km from the heart of the medieval town of Aurignac. 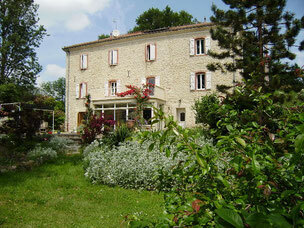 - La Noue suite with two bedrooms ideal for a large family or a group of friends. - La Louge romantic suite with a double bed canopies. - La Nère suite with a double bed and a single bed. Our holiday cottage is Independently situated by the swimming pool for 4-6 people. The rooms at the Moulin du Pont are ranked "3 Epis" by Gîtes de France. Breakfast is served inside the veranda or under the pergola according to season and preferences. Pleasant visit to this site and we look forward to welcoming you to our guest house.